More of? Less of? What would you like to hear? If you’re a regular reader here on Funky Junk, you may have noticed I’m kind of a wing it type of writer. Planning is tricky for me. For if I plan something, it suddenly becomes ‘work’. Because I am built the way I am built, I don’t plan even one blog post, except for the weekend link parties. Everything is spur of the moment, as it rolls fresh off the life press. Photos are seldom older than 24 hours. 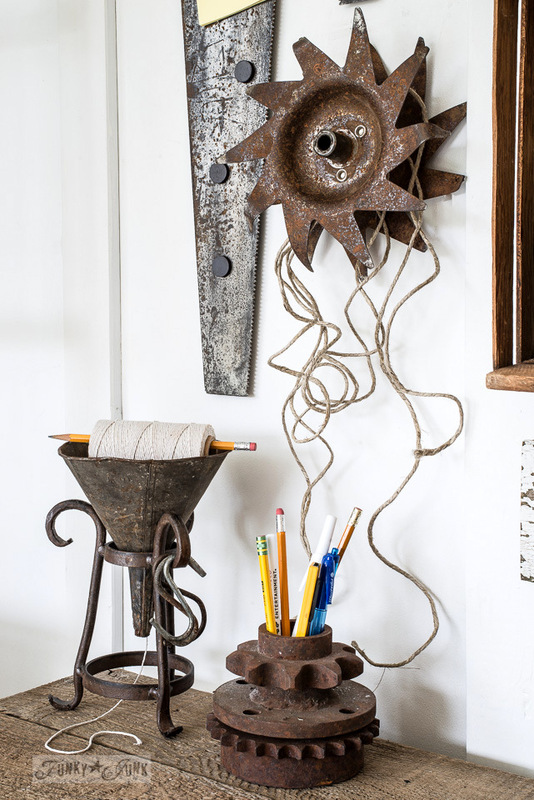 While my main premise is about decorating with junk, if I just blogged about that, it would’t fuel me quite the same. Therefore, you’ve come to expect a real mish mash of topics. Thing is, life simply blends into other areas. Over the weekend, I took a poll in comments HERE on last weekend’s link party to see who read those types of posts. 77 comments later, you came out in full force! I drank in each and every single comments. Thank you for chiming in! But in all fairness, most chimed in to that post because they do read those posts. So today’s post is geared so everyone has a chance to be heard. I want to know what kinds of things you like hearing about. And perhaps, some you’d rather not. So…. here’s what I DO blog about… and why. There is NOTHING like grabbing a bunch of junk and just making it work. 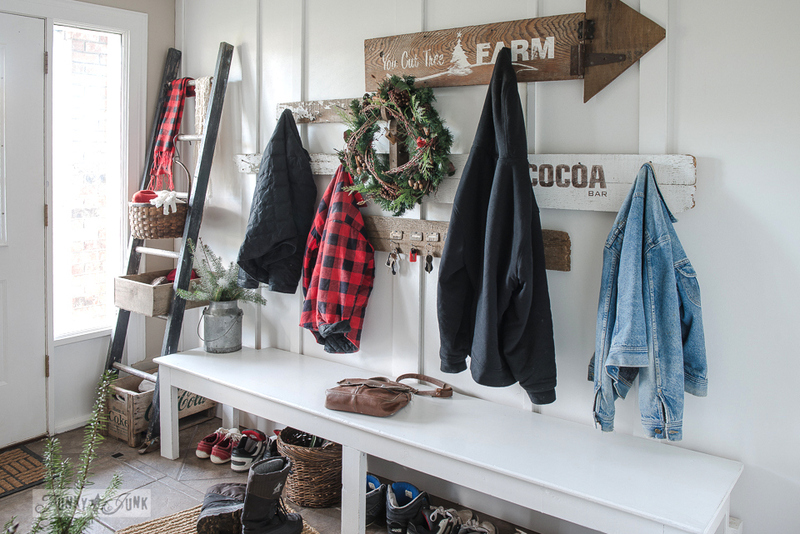 My personal favs are when a full room finally comes together, such as the blog office above or my farmhouse bathroom. But the smaller projects are quicker and easier to produce. 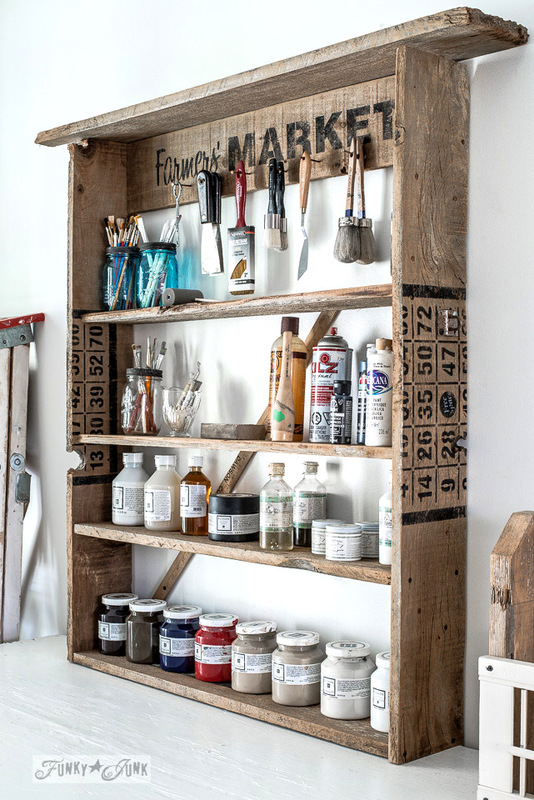 And just as much fun, such as this shelf made from reclaimed wood. A year ago, I came out with my own line of stencils themed around the old signs I was making. This was created out of a need… I was getting asked to sell the signs or sell decal stencils. But I desired to remain a designer, vs. a manufacturer, soI held out until I landed the perfect folks to work with. So naturally, I share my new designs, and creations with you. But I do try and pace it out, so you only perhaps see a touch of the product line once a week or less. I also incorporate lots of junk decorating around a launch, so there’s MUCH more to take in than one simple new design. Most of the signs ‘do something.’ Just like how I really decorate in my own home. After acquiring my newest toy, I’ve been hitting the local bike trails. I’m not an athlete by any means. I jump on the bike, jean and heavy jacket clad, and head through the heron reserve. But always find a story to share along the way, whether it’s about a sunbeam that follows me, or visiting my parent’s farm. Oh goodness. I couldn’t imagine not sharing where I hit the road to next. Whether it’s a road trip local to me, heading for the tropics, or offering up Disney tips during Christmas, you know I’m good for a story or 8! I’m so not one of those planned bloggers that stores projects to post about for when I’m gone. I write about where I am. By far, most of your comments come to life when I share a story that’s hard to belt out. But I also like to write about fluff too, when the mood strikes. This has also spun into simple thought kind of writeups, I’ve deemed Daily Junk Mail. My latest hard story to write was How to make it when you’re newly single HERE. And of course, my life story HERE. By now you KNOW I’m not a super tidy person. So cleaning posts are a must, while attempting a little revamp to pretty things up and hopefully, inspire you to do the same. Thing is, it isn’t nearly as fun if I clean alone. I’d much rather challenge you too! A link party transpires every Friday night, and runs through Sunday night. 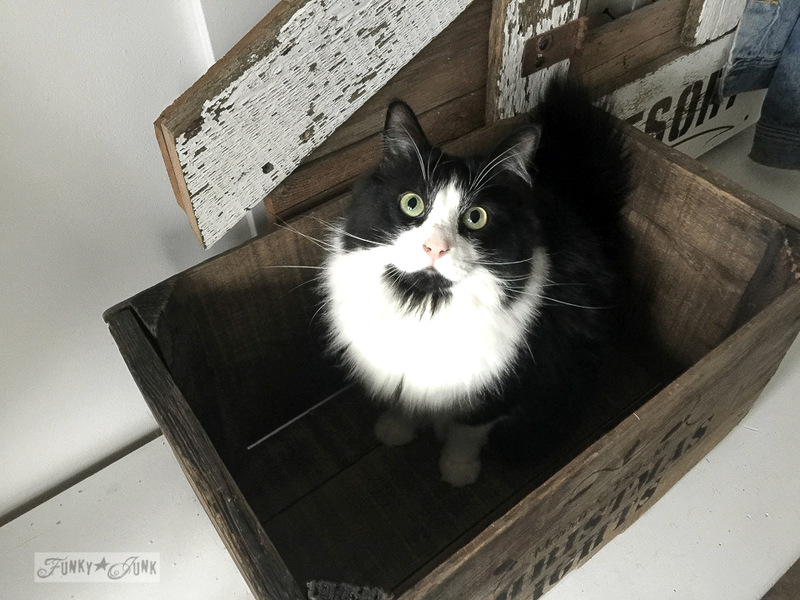 Bloggers are invited from all over to bring their latest junk projects, in which I feature special highlights each week. I also inject a little of my work in these posts, but they’re mainly about what others bring over, for a refreshing change. Another reason… I don’t write on weekends. I usually use that time to create or enjoy family time. 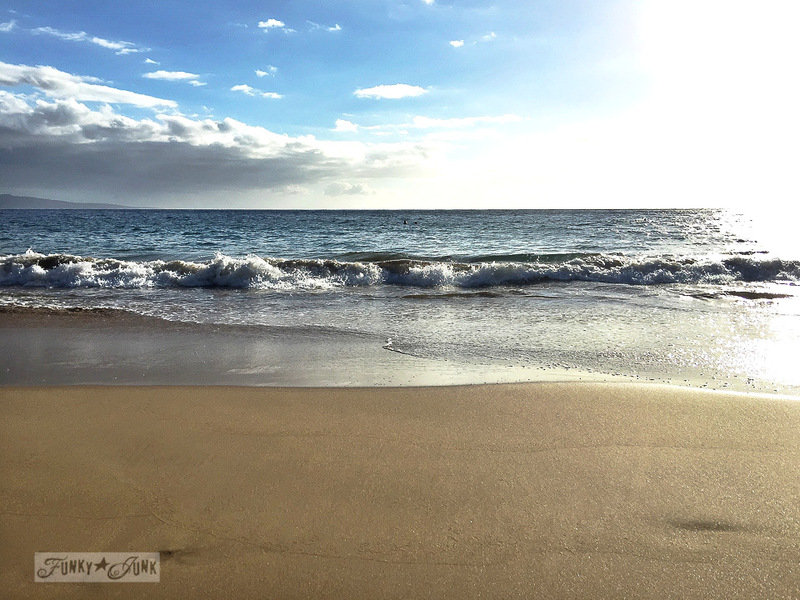 So the weekend post is for two things… to help fuel you with fresh ideas from others, and to give me a little time off. So this link party is kind of ‘an extra’, not an ‘instead of’. There are more things I write about too of course, but this is pretty much it in a nutshell. And now I’d like to hear from you! Is there more you’d like to hear about? Less of? I’ll update with a new post after hearing you out. Thanks Donna for taking the time to inquire of us what we would like to see more of or less of. I am not real analytical, but instead respond more from emotion. Putting a blog together is like greek to me so I’m afraid I’m not much help with the nitty gritty. What I do know is I appreciate the style of your blog, i.e. the excellent photos with all the good lighting and the easy access to past posts by just clicking on a button. The ease of it is great. I do respond to photos before words. I guess that would define me as some kind of learner, but I don’t recall the title. So in my rambling style you could say your photos draw me in first. The topics and variety of them are great. Which then covers your writing style. Your narratives are heartwarming, funny, serious, thought provoking and analytical. The analytical part is where I will reread a sentence over and over and try to learn the ins and outs of building. The posts where your favorite tools are spoke of is interesting. If I had tools that I understood and could use there is so much more I could do. I am procrastinating on this issue and just gotta do it. And then I remember how you told us on your blog how you just jumped in with both feet to do something. I’ll find that topic easily and push that wonderful button, read your post about learning to do something and doing it even though you’re unsure and presto, I feel like I’m capable of trying something new! In essence, your post is helpful and informative and I love it as it is. I look forward every day to see what you have for us, your blogging friends. Thank you for taking the time to read this and for caring what we think. I love your site as it is. The photography is amazing and that’s what draws me in. 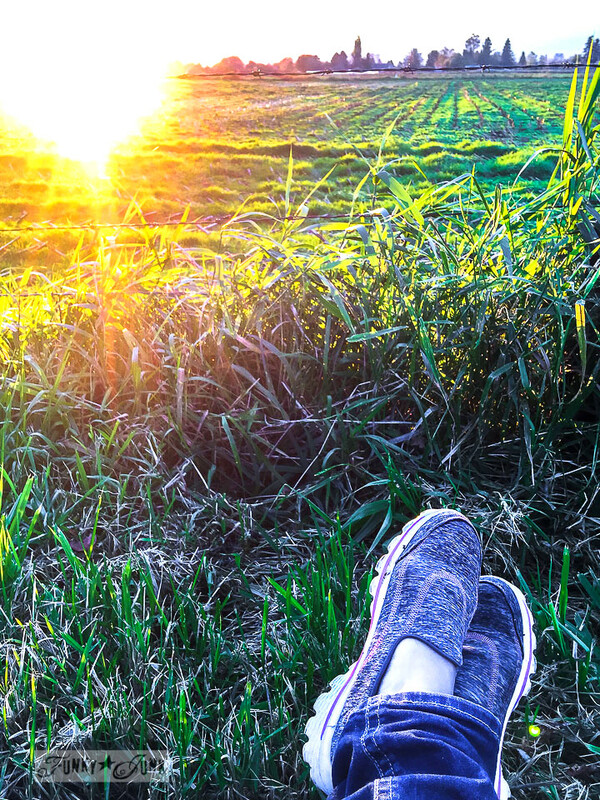 I love your relaxed style and the way your personality shines through. A mixture of stuff is good. I love your junk styling but also loved reading about your holiday in Hawaii. This is definitely one of my favourite blogs its beautiful and seems genuine to me (not too contrived like some other blogs). I love you just the way you are. YOU have INSPIRED me. I’m not going to be much help b/c I enjoy the variety of your posts. I’m here for the junk…but enjoy & continue to enjoy the stories you share about your life & your cats…so cute. I also enjoy any of the organization ideas & how you get all of this done! I’m sure the business side is not for everyone, but I appreciate any tips. I understand that you want to pace out your stencil designs, but it’s your business…sell girl! Looking forward to a bathroom stencil design! Whatever path you take the one thing I believe you do well is giving back. You interact with your readers & the kindness in that is more than anyone could ask for. I was just reading other comments and I concur, your kindnes shines through which is another reason I come here. Thanks, Jane, for mentioning that! I agree with Claire in that I enjoy your relaxed style and the personality of your own voice. I also really enjoy when you talk about the simple things that you do where you live – like bike riding or fixing up the front of your home. I like to hear about where other people live and what the surrounding area is like because it’s very different from where I live here in New England. I’m also a blogger and take cues from other successful stories like yours, so I’d also enjoy more stories about how you grew your readership and key things you did to set up your blog that you feel help made it successful. I’m working to add a lot of small business tutorials to my blog so if you ever take on guest posts, I’d love to be considered. I have been following you for a long time (I wish I knew the actual date) and your posts/site is one of my favorites. I like the things you make, your style of writing, your conversations from the heart…heck, if I lived next door, I like to think we would be best friends and partners in crime. Keep doing what you are doing and don’t make excuses to me about how you “trick” yourself into writing. You are the creator of this blog and I come here to hear what you have to say. I appreciate that you are asking for feedback. No complaints here but I will keep in mind that you welcome honest comments and will try to let you know what I think, feel and want. More cat pics, I have 3 myself and they are the bomb. I enjoy all your posts but the ones that get my attention the most are showing how you have used the projects you have made. Sometimes I have things sitting around that I like but just need some inspiration on how to include them or decorate around them. The Link Parties are probably my least favorite because(and maybe I’m doing something wrong) but I just don’t always have time to open a bunch of new pages and go through the content. I enjoy what you do – it reflects your personality which is great. I don’t always have time to read everything…. but when I make the time to read it makes me smile. Everything you are doing is absolutely perfect! We all love every post! 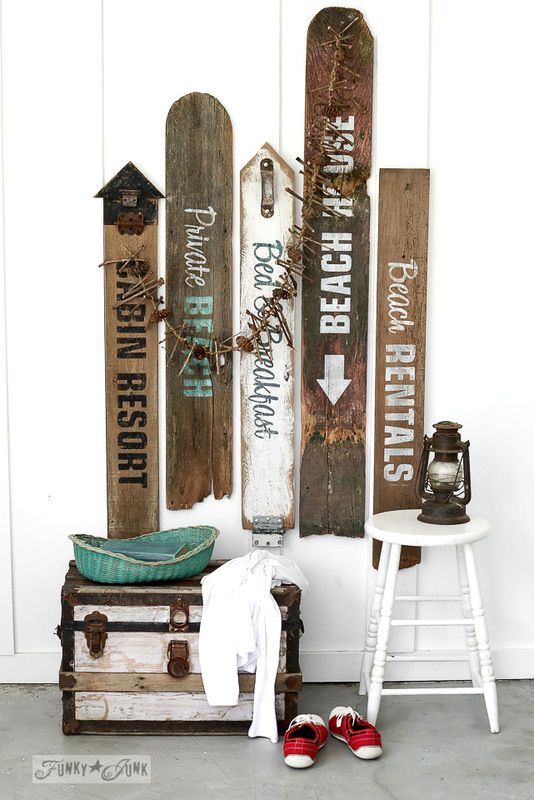 I love your posts about the stenciling projects/signs and the things you build with the reclaimed wood. Your projects are so unique – just my style. The Link Party is a little overwhelming. I get started on it and then there’s just too much going on and when the ads pop up with every photo and you have to click the x to make them go away it’s frustrating. Hi Ginger! Those ads on photos bother me too. I’ll see about getting them diminished somewhat… there should ever only be 3, but sometimes they get out of hand. Thanks for sharing this! A blog is a reflection of the writer. To sustain a blog would seem to require you to be true to yourself so your passion will be a wellspring of ideas to share with us. 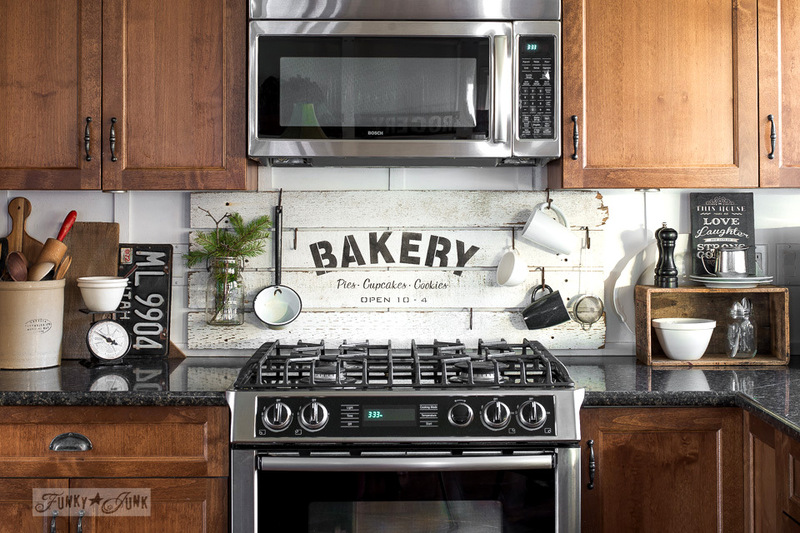 We are grateful that you furnish us with ideas and inspiration – “I what -could use a drill myself?! !” Just keep on doing what you do! And Thank You! Be yourself and don’t change for others. I like your blog and the fact that it isn’t planned out, just like life. If there is something you write about that I don’t want to read I go past it but, that doesn’t mean others pass it. Keep it real. Your blog continues to be a great inspiration for me and I look forward to each of your postings. I would love to see a segment on basic tools. What these basic tools do by showing a project idea to accompany them. This is an area where I would love to grow my tool box with items that are needed and how to use them. One million percent agree! Now I have to learn what to call everything… hahah! Working with tools is officially on the list! Thank you! That’s a BIG YEP to ALL of the above- I love to come here to see what you are creating, feeling and where you might be going. (and the kitties too-please!) Please continue!! If you come up with things to add along the way, so much the better! How about learning how to use power tools like a mitre saw? I’m very scared of that one but would like to learn , including how not 5o chop off fingers! YES! I’ve been meaning to do a video series on working with tools for years now. It’s time to get set up to do that. Thanks for the push! I LOVE your blog and enjoy all your posts! But, I especially LOVE your stenciled signs and hope to one day be able to duplicate some. I’d like to see you come up with more stencils, too. Keep up the good work. It’s always a joy to see your blog posts pop-up in my email – a nice surprise when they come – and something I look forward to. Thanks for sharing. I LOVE all your projects and admire your willingness to tackle just about anything. I finally got some better tools FOR MYSELF – JUST ME – I’M NOT SHARING- and am being a bit more adventuresome with what I tackle, myself. Thanks for the inspiration. Donna, agreeing with the other writer’s seems to be the trend, and I do, especially Michelle’s comment about the Link Parties. Of all the many things you do that I love, this is my least favorite. However, these parties do give other bloggers and future bloggers a place to feature their work, get support, and keep on working. So the dual edge sword is in your court. You give your readers choices, read current or past posts, challenge ourselves or live vicariously through you. Whatever your decisions are about your site I know they will be the best for you, your work and your life with son in tow! I love reading everything that you write about , your sense of humor about life is precious! I only read a couple of blogs and yours is one I can’t wait to read. Your love of wood speaks to my heart,I also love wood in all it’s natural glory,aged,beat up,rough edges,there is nothing better to make a home warm and inviting than a piece ( or 6000 pieces ) of nature’s most beautiful resource! I like your diversity of topics and choose to read what interests me at the time. I used to live in Vancouver so especially enjoy your excursion trips to see if I can recognize any areas. I love your small builds and ideas for signs. Your trip to Hawaii was so interesting- and I enjoyed a vacation vicariously through you. You write with honesty and without pretention. I look forward to your newsletter and to see what new project you have come up with. you seem to be doing everything- “just right”- I wouldn’t change anything! I absolutely love your blog. I can spend way too much time looking at all the different things that you make and write about. It truly draws me in. Don’t change anything…..Love it just the way it is. Last Saturday I was at a show in Joplin MO called 2 Friends and Junk. I was so excited to see one of the booths using your stencils! Please keep sharing from the heart. Well now, that is exciting to hear! It’s really cool when your product starts to be recognized out there! Thank you for sharing that, Dayna, and for your kind words! I always enjoy our conversations.. I feel like your someone I could live next to and enjoy seeing each day. Cant wait to see your yard in bloom. Donna I love your blog just the way it is. I love your photography, your pictures are beautiful, love it when your beautiful kitties photo bomb, haha. We have had the pleasure of watching your son grow up and mature and become a responsible young man that still enjoys doing things with his mom. I love your adventures whether it be to a beautiful tropical island or on your bike or a very personal story you are sharing with us. you see that is what makes your blog so special you share so much of your self and your life. You have taught us all so much, but mainly don’t be afraid just do it. Because of you I now have an electric drill and a battery operated drill a circular saw that I’m still learning how to operate, and many other tools I have been picking up at yard sales and auctions. I now have my own over-flowing tool box and I’m hoarding all kinds of wood. I remember last summer I saw a really rustic arbor made from cedar limbs and rope, I instantly thought of you and thought you probably made it, but on further search I found it was made by a man, but it looked like something you would make and this spring I will attempt to make one myself thanks to you. That is what you do you inspire you give confidence, and I thank you. One thing I would like to see more of because you are so good at it is more yard projects. I need help and ideas. Donna, I love your site and how you share your struggles with getting things started and done. You have mad skills and a “good” eye for design. My problem is that I buy or obtain things to make into something and then it just sits there. I never can get time or motivation to start. Seems like I’m always too busy maintaining what I already have. Then when things get crowded and scattered , I feel like I want to throw it all away,(actually donate). Any advise? The key for me in creation is out of need. If I need something, that’s when I’m encouraged to go through my stash and see if I can make something work. Let’s face it… our homes only hold so much. If we don’t need it, we likely won’t make it. That said, sometimes I create things for new stencil designs that I don’t really need. But of course, it’s part of my biz, and that’s why I have a photo studio! But most of what I make, I implement in my house. And if it gets too full, I have to ditch some stuff to create need all over again. I’ve followed your blog for quite awhile now and enjoy its diversity. I come for the clever ideas you create, but stay for the personal elements too. Whether it be through the great photos or meaningful revelations, I enjoy the journey. Thank-you! Personally, I love your blog just the way it is. I enjoy reading your life stories as much as I do the DIY projects. If I could, I’d move to Maui. 🙂 And we did your farmhouse window trim throughout our entire home. We also planked our powder room ceiling due to your inspiration and tutorial. When we’re able to get to the decorating part of the remodel, I’m going to use more of your ideas and stencils :). I enjoy your authenticity and how you’re simply you. Because these things shine thru your blog posts, I feel as if you’re also a friend. Thank you for blogging and sharing both your life and DIY projects. Some day, thanks to your help in this process, my home will no longer be ugly and I’ll be on the beach in Maui – even if it’s just for vacation ;). THANK YOU for everything and for a job well done! Look forward to all your random ramblings, wherever they take you. Keep up the good work. I’m facinated by your artistic sense and real life willingness to put yourself out there for all of us ordinary folk. Please keep doing what you do. 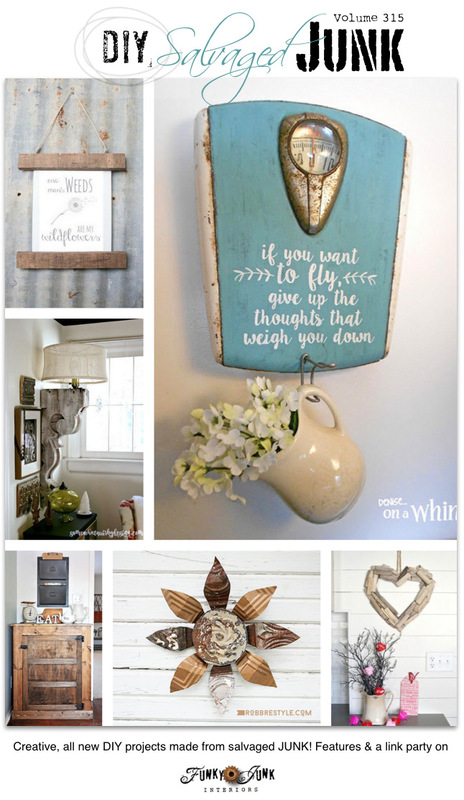 I love your whole blog, but my favorites are decorating with junk and the signs!!!! I’m here for the junk… but love all of the other stuff that makes you, you. The cat “tails” are also high on my list as well as the photography. I enjoy hearing about your journey as well as your journeys! You have to do what’s right for you… And not be stuck with what you think everyone else wants to hear about. You can’t be everything for everybody! Just be you! I have followed you for a while and enjoy the diversity of your topics and the things you make. 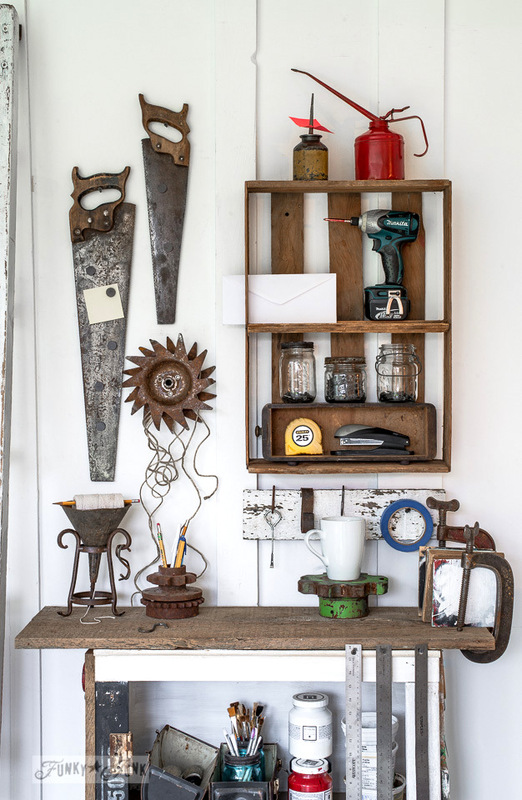 I love the “junk” aspect; I am a closet junker but do not have much of it in my home. I love to go to antique shops or flea markets to think of the possibilities and have a collection of old unique flower vases (just about all I have room for). I love all that you do with the junk and enjoy that you have put it all to such use. 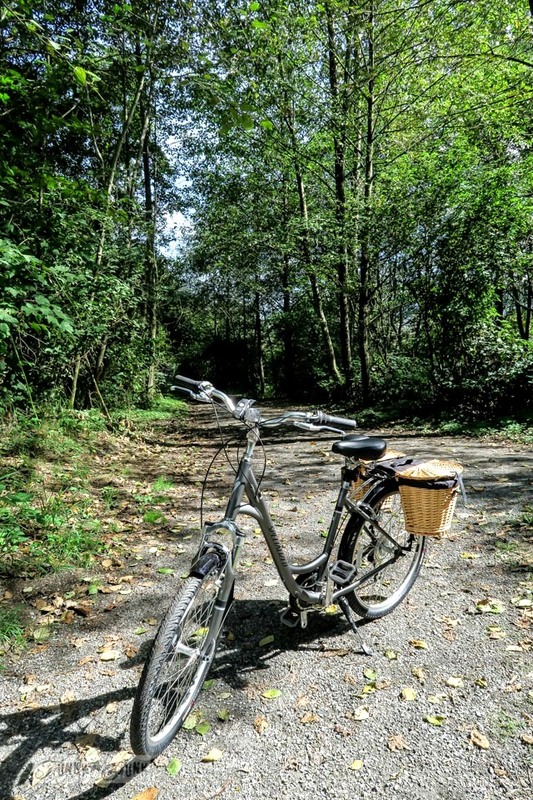 I love the bike rides/stories, photos, trips, family life…keep it all the same. It all interests me and keeps me coming back to what the surprise topic will be each time. 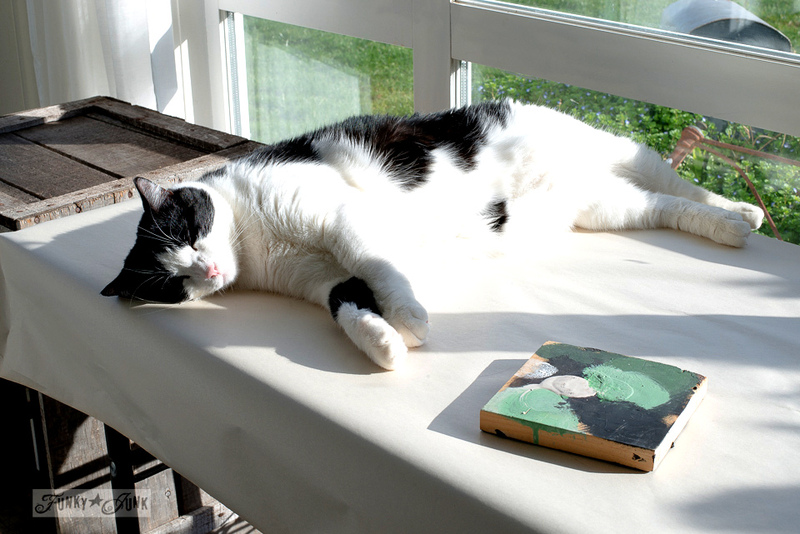 Your cats are similar to those of mine that has passed; and they bring a smile each time they show up in your photos. I feel like I have known you from afar or just down the street for years! Love your spirit, creativity and realism! I like your blog as is…. Hi Donna. I love your blog and have been following for ages. My favorite is small builds with junk and probably least favorite is bike riding adventures. I really appreciate your vulnerability and humour! Keep up the great work (play)! I enjoy everything about your blog because it reflects the various facets of YOU. If I could describe the style and tone of your blog in one word it would be “authentic.” You are who you are and you don’t change for others. That comes through in every post. You know I’m domestically and decorating challenged so I don’t come here necessarily for those things, though I do learn a lot from you. I visit your blog because your whole blog carries one pervading message: “You can do more than you think you can so just jump in and do it.” You inspire me to try new things and to live the life I want to live. You show through your life that anything is possible to the person who believes. It’s YOU, dear heart, that keeps people coming back to your blog! I’ve recently unsubscribed to many blogs because they get so repetitious and boring….which you never are! I like that you included all sorts of things, I always enjoy your thoughts, pictures, instruction, cat photos, whatever. The only thing I’m not real crazy about are link parties, I hate having to click through to see other stuff, I think I’m too lazy. And I’ve got so many ideas from you, thank you! So basically, keep doing what you’re doing and be yourself! I expected to hear a LOT of varying opinions… but most of you are just saying stay true to you just the way you are. The fact that you find value in my normal schnormal everyday life, and find meaning in something I have to say… well, that’s dream talk, friends. DREAM TALK. Imagine going on stage with no one interested in what you had to say, vs. standing room only. Thank you! But please don’t be afraid to critique any way you wish… I promise, it’s all good! I do not think you should change a thing as I have enjoyed it all. Mine is not a one size fits all type of blog either. While one should always strive to improve, please don’t edit out your delightful personality. Would you ask or require that of a friend? Well, we don’t ask that of you, either. It’s so refreshing to find that you are interested in so many things. More of us should be. That said, I super-love your projects and the way you see treasure in seemingly unrelated things. You are so inspiring! When I collect “junk” to re-purpose or just to use, I cant help but get this image in my head of a house that just has too much stuff. Junky, old and dirty. I cant seem to let go of that image!! I feel proud of my projects when I finish though. I sometimes thought that I was the only one who can see how cool finding and then creating things are. (I usually get, “what are you going to do with that? ?” followed by a “why?”) I love how your creations are old, new and fresh at the same time. Thank you for inspiring me and giving me even more ideas!!! I would be a happy girl if I could create all day long! I love everything about you site and can’t wait what you do next! I love to read about your travels and your bike trips. I enjoy your renos and remakes, but the bike trips are the best. I love, love, love all your posts. After work I enjoy grabbing a cup of coffee and seeing what new creations you have made with your rusty junk. I truly enjoy your honesty and your realistic, simple DIY projects. Please don’t change a thing, your blog is amazing-always something new. Thanks for the inspiration! I first came uoon your blog at least 6-7 years ago. I believe it was the first blog I’d ever seen! What drew me in was the “Junk”! I L o V e JUNK! I love finding it & creating with it! Your photos grabbed my attention! Old, rusty tools, wooden crates, pulleys, ladders, and the list goes on and on! After the pics drew me in, your writing style kept me there! Your personality and sense of humor literally comes shining thru with each & every word you write. I too, have read thru some of the comments and almost all have said they feel like if they lived next to you a friendship would immediately develop. I have to agree! As I read thru your stories and projects I couldn’t believe how much we seem to have in common! But I really “connected” with you when I read about your divorce which lead you to head down a new & different path, starting a new chapter in your life. Not just the divorce and starting over, but working…CREATING! (working, ha! that’s a nasty little word!) with found, recycled, & repurposed JUNK!!! Your whole story; your courage, creativity, honesty, & sense of humor…all of it, showed me that it was perfectly PERFECT for me to be ME & live MY life exactly HOW I WANT TO! Keep bloggin’! You’re a major source of inspiration for me! For many! I have been living under a cloud of “good grief” lately, it happens and I know from getting to know you through your blog that this too shall pass. Life is unpredictable and you share warts and all but, you have an amazing way of showing the silver lining of life. My 2 cents, keep it simple and stay real. You are doing great. Donna, I adore all of your posts and have followed your blog for years because I love JUNK 😉 But, when you started sharing your heart in real stories, that’s when I would purposely look for updates every day. Your stories have touched me and although I’m not single, they give me the kind of inspiration that everyone needs. The kind that says, when life gets hard, you can still survive! My only disappointment would be if you ever stopped putting your personal stories in with all the junky stories. I love getting your blog in my email. I love to listen to your life stories, what you’ve been through, your discoveries, and your creativity. I love the crap to clean series, your junk projects, and especially your bike riding journey. You speak my language and it comforts me. I love your blog just as it is….all of your subjects. And the photo bombs of the cats….I LOVE cats!!! We have two litter twins and they are our fur babies! Keep it up….”you are enough”!!! After reading all comments, I debated whether to add a comment because most expressed exactly what I would say. However I don’t want you to “burn out” feeling you have to post on a scheduled basis. The weekend link parties are my least favorite because of having to open several sites (as others mentioned) and I would be happy to get a weekly post from you. Getting behind in Feb., I took one evening to read every Feb. post because I had to see and read what I’d missed. Recently I got an email from Pinterest saying they had found someone who shared 12 pins with me and guess what…it was your site! I just like how unique your blog is as compared to others. You dare to be different, to see things maybe we don’t see, to make new what was once old and possibly even headed for the trash…. and ever since you bought that bike, I’m jealous… because I’ve been wanting a bike for years and don’t know why I don’t just go buy one…. is it the fact that I’m 62 and keep imagining my 62 year old bones in a mangled heap when someone who doesn’t think bikes belong on the road lets me know? Or am I afraid I’ll have too much fun? I can’t figure my hesitancy out, so, until I do, I live vicariously through you. And I look forward each week to all the old things other people are also re-imagining. Funky Junk is on my list of favorite blogs…. 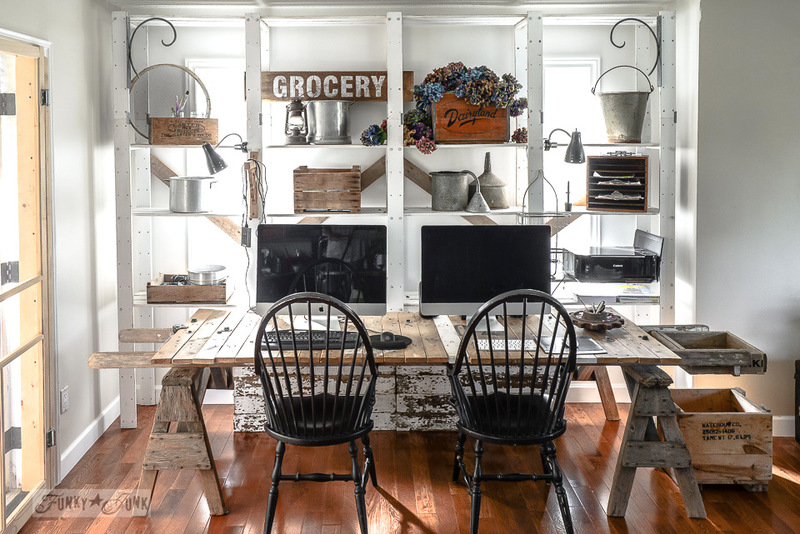 right up there with The Lettered Cottage, Thistlewood Farm, Miss Mustard Seed, and Tuesdays With Dorie….all passionate people about life and decor. You all draw me into your world and make me a better person. Alright Cindy, your comment got my attention. Thanks for the kind words by the way! But, you need to go get a good bike today. I give you permission! Go to a quality place, where they can outfit one that’s perfect FOR you. Try many! Let them make adjustments. Be prepared to pay for all that lavish attention… because it’s worth every dime if you WANT to get on that bike! Donna, I haven’t actually been a reader for that long, but I just want to take the opportunity to say that you have such a wonderful, natural way of communicating in writing. I concur with all the other comments that I believe we could be friends in real life and communicating that is a testimate to how you connect with all of us through your writing style. You’re an inspiration! Sorry to be so late to the party! Life! And that is what I love most about your blog! You keep it real every day. I love the junk repurposing, the photography, the travels, the signs and the link parties. I love it all and I think you are one very extremely talented lady. I appreciate that you have shared your life with us. You are an inspiration. As you can see, I read your posts but not necessarily in a timely fashion. I love your blog and in my next life I hope to be like you. I know what I like when I see it but I can never get the look for myself. I hope you just keep doing what you are doing, it’s why I started following you in the first place.